This is a huge collection of Best Vintage And Retro WordPress Themes. Don’t strand anywhere. Everything is already here. Starting a new retro business? Or already have one but looking for a best Retro WordPress theme to make a great website for your business. You are at the right place then. This collection of Best Vintage And Retro WordPress Themes is all what you need. No matter what is your business is about, you can find the perfectly matching vintage and retro WordPress theme from this collection. Tuned Balloon is an easy to use theme with flexible layout that looks great on any device, big or small. Tuned Balloon theme uses basic, core WordPress options (pages,post,categories) to create site that is easy to use for very beginners, but also for advance users. This theme makes full use of the new customization options in the latest version of WordPress. We’ve implemented an extensive color scheme options panel so that you can change the color of your theme to anything you like. «Benissimo» is the WordPress template, which is made in a vintage style. Keeping pace with the times we offer a truly high-quality solution. Combined with a thoughtful and carefully elaborated design, «Benissimo» will leave no one to be indifferent. Using this theme you can not only increase conversions quality and number of positive reviews but also make a pretty good surprise to your customers. GOLDEN is a beautifully elegant, visually stunning, and multi-functional vintage inspired WordPress theme. Perfect to use, from freelancer to agency, and everything in between. The template is fully responsive, and looks amazing on your Smartphone, Tablet, and Desktop. Beautiful typography, minimal, but elegant vintage styling, subtle CSS3 effects, and those small details that really make you stand out from the crowd. RetroPress is one of the best stylish and clean retro themes for WordPress blog. It has designs which are good-looking. It contains powerful functionality that allow you to create amazing retro blog. RetyX is a Blog and Portfolio WordPress Theme in retro and vintage design. It is suited for users who want to run a professional or personal blog and wants to showcase your products, services or news in a creative and unique manner. “Retro Portfolio” is a WordPress Retro-style theme. It consists on a one-page portfolio with a blog and a contact section featuring a ajax contact form. The Fox WordPress theme is a retro style perfect for creatives looking to showcase their work. The theme focuses on featuring your portfolio and connects to Dribble to display your latest shots. Retro Portfolio is the one page vintage WordPress theme. Extinct is a WordPress portfolio theme delicately handcrafted to meet the needs of a creative agency or similar businesses. The name Extinct is derived from the fact that this theme is a celebration of old style, what is known as Vintage and Retro style designs and incorporates various unique design elements inspired by these styles. It’s a result of our extensive study of design of countless actual Retro/Vintage style websites, posters, prints. Nostalgia is a minimal portfolio WordPress Theme – personal or corporate, based on full-screen slider and sliding pages. The Theme is maintained in a minimalist, contrasting style. Background images kept in retro tones contrast with modern minimalist content. It is possible to add unlimited number of pages in the form of scrolling menu. Introducing Hipster, the perfect responsive WordPress theme for any personal or business website. Hipster’s fully responsive design looks great no matter what device you’re viewing it on, desktop, tablet, mobile phone, etc. Customize your site with the extensive options panel using over 30 backgrounds patterns, full screen rotating background images, and 2 page layout styles (stretched or boxed). Check out the custom mobile menu that was created for small screens! Hipster is full of premium plugins to build your dream website, tons of page layouts, and oh ya.. did we mention the awesome retro style design?! A responsive WooCommerce WordPress theme for travel, hotel, business and travel blogging, tourism, adventure websites. World is a great choice for nature lovers, travelers, travel agents, and consultants. You can peel the travel part of it and build your own eCommerce store, retro blog, hotel Website, in minutes. An Awesome one page vintage wordpress themes with responsive blog. It has custom jQuery features, Nivo Slider, Widget Ready and Ajax Contact Form. The Fox WordPress Theme is a Retro style perfect for creatives looking to showcase their work. This theme focus on featuring your portfolio and connects to Dribbble to display your latest shots. HANNA is a stunning, retro template. Perfect for the ‘Instagram’ generation. The template is fully responsive, built on HTML5, with the latest CSS3 features. Beautiful typography, gorgeous image effects, and a ‘Retro Minimal’ look, combine to bring you a luxurious template that will truly make you stand out from the crowd. Dirty Saloon is a premium responsive WordPress Theme with a clean and fresh Design and innovative AJAX loading of Posts and Portfolio items (you can turn this on and off on demand with one click in Page Builder. Reborn is the personification of a combination of two completely different styles. Make your site have a unique atmosphere both retro elements and modern. iRibbon Free Responsive Mobile Ready WordPress Theme with Drag and Drop Page Elements. Delimondo is a powerful WordPress Template built for restaurants and food lovers. The template automatically adapts to window resolution and looks fantastic on all devices! Gigawatt is eCommerce ready so you can start selling your products as soon as you’re ready. The eCommerce functionality is powered by WooCommerce, an impressive eCommerce plugin that continues to get better and better. Alveera is a single page wordpress template with a little retro look. With the combnination of nice color variation and pleasing design it can be user for both personal and professional sites. Angelo is a unique, classic and elegant premium WordPress theme initially inspired in the painting The Creation of Adam by Michelangelo. Responsive Woo Commerce WordPress theme for Travel, Hotel Business and travel blogging, tourism, adventure websites. The theme will be a gifted choice to Nature lovers, Adventure travelers, travel agents, consultants. GOLDEN is a beautifully elegant, visually stunning, and multi-functional vintage inspired WordPress theme. Perfect to use, from freelancer to agency, and everything in between. Cafe Bonjour is a WordPress one page template, best fit for cafe and restaurant websites. The template has a classic style favor, it’s vintage looks making it suitable for classy, exquisite caffeterias, as well as luxury and exclusivist restaurants. Responsive WordPress Theme perfect for Creative portfolio showcase and personal blog/portfolio style websites. Feature blog and work posts on the front page, set a google map and contact form on the contac page. A beautiful great typography, unique design include lots of impressive features. Retro Scroll is a professional single page creative portfolio template that scrolls vertically and incorporates a subtle vintage design style. It will help you to create your very own online profile, with the ability to showcase your featured projects in style. Powerful site template designed in a clean and minimalistic style. This template is very flexible, easy for customizing and well documented, approaches for personal and professional use. Tensor has been coded in HTML5 & CSS3 and jQuery. It has a solid flexible responsive layout that scales from 320px to 1170px width all Bootstrap features. Follow me to be notified for future updates! The RetroPress is a great retro WordPress theme with a wide range of features that includes a dynamic content loader, a responsive web design, Google Maps shortcode, social share bar, and translation options. With this range of functionality, you can create a website with that awesome retro feel. This Retro WordPress theme makes use of HTML 5 template that allows users to customize animation and graphic elements. The lay out consists of a header, portfolio, content and contact section. This portfolio and blog wordpress theme has both the vintage and retro design suited for bloggers who wish to showcase services, news or products in a exclusive manner. Aerogram is a clean, flexible and responsive theme for WordPress. It was crafted with bloggers and classic blogging in mind, while being modern and responsive. Use it with large photos as headers to get it’s full potential or leave out headers to keep it simple. RetroCar is one of the best stylish and clean retro themes for WordPress blog. It has designs which are good-looking. It contains powerful functionality that allow you to create amazing retro blog. Secundo is a Responsive HTML5/CSS3 design and is built with Bootstrap 2.2.1. A tumblr-like theme for WordPress. Post audio, video, quotes, links, photos and normal posts in a snap! Nico is the perfect theme for those who think it’s time to put their work online. With 2 alternative layouts, multiple color schemes and many custom options, setting it up will take minutes! 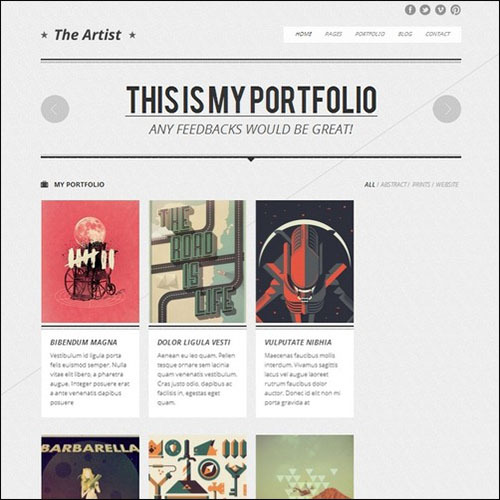 The Artist is a super awesome portfolio theme. It’s very clean, sleek and modern design. With the admin panel and page builder in this theme, you can discover unlimited possibilities of what the theme can do. Moreover, responsive feature is applied as well. Now, you or your clients can explore your amazing works through phone or tablet easily. Endless is a clean and stylish infinite scrolling theme, perfect for bloggers and storytellers. We’ve delicately put together some awesome HTML5 mixed in some CSS3 and added a bit of jQuery on top to make this beautiful theme just for you. Retro is a clean and modern template, best suitable for your portfolio or business site. Quick and easy to set up, this template is created with the latest CSS3 techniques. Responsive WordPress Theme perfect for Creative portfolio showcase and personal blog/portfolio style websites. Feature blog and work posts on the front page, set a Google map and contact form on the contact page. This simple and elegant WordPress template is great solution for photography portfolio blog. ProFoto, like our other themes, comes with Shared Bar that will help your visitors to share your blog with their friends. MJ is a HTML /CSS/Wordpress optimized Theme perfect for wedding invitation, personal and business websites. Theme also supports tablet versions ( both 800×600 and 600×800 ). A parent based fun-theme that supports navigation menus on WordPress. The theme also includes areas for widgets and per-post layout. This elegant theme is laid out like an old book making use of beautiful typography. It also allows the user to style the first line on the blog in small or bold caps plus make use of classic typographic effects. Elegant and visually stunning, this vintage theme is multi-functional which offers minimal styling, CSS3 effects and stylish typography. The Golden template is responsive making it look great on the tablet and Smartphone. Despite the vintage feel, the Angelo has modern features like unlimited color styling and filterable portfolio. It has 60 plus options within the panel and Google fonts may be implemented to create headings. Indie-fest was designed ideally for folk artists, pop stars and indie rockers. This theme is just one out of many retro WordPress themes that emits the laid back and summery feel. It takes customization to a whole new level with the choice of 8 backgrounds, 15 accent colors and 17 main colors. Postcards have been used back in the 80s for travels. The postcard theme incorporates the same idea with the Google Map integration which allows bloggers to geo-tag posts. This is best for travel bloggers who want the no-nonsense feel to their blog. This vintage styled WordPress theme is fit for creative individuals. The theme makes it easy to set up a stunning portfolio and advertise services plus samples of work. CH3 combines modern with vintage which makes it ideal for professional WordPress bloggers. The theme is full-featured including source files and is widgetized. Utilizing the “Art-Deco” style, Nine WordPress falls under vintage styled themes that make use of widgets and customizable source files. This vintage looking WordPress blog makes use of videos. Unlimited videos can be displayed in a catalogued format. The template offers a layout of three columns and is packed with three color schemes. Laid out like an old magazine on interior design and science, Paragrams fit the journalistic type of blogger. It has advanced custom features that are quite easy to use. This stable and clean platform utilizes Genesis framework for WordPress that also allows unlimited support and updates. Going green also has three layout options and fully customizable background. This retro WordPress theme utilizes the ancient-styled book. This theme is suitable for bloggers who wish to add charm of the past to their blog. Header image and custom menu are fully customizable. Meet Klou. If you are looking to build your portfolio then you should consider using its highly customizable templates and select one of the 9 available color schemes. With the all-out frills and girly feel, Fancy Vintage is appropriate for fashion bloggers and photography portfolios. Content area is wide enough to show photos alongside text. Title and background fonts are also prominent on this theme. Beautiful and grungy, Old School has the magazine-style retro WordPress theme. It is fully customizable making it easy to blog everything from scratch. Sophisticated and unique, Sophis has a lot of jQuery effects plus five color schemes. It also has easy to manage features easily accessible on the options panel. Another retro WordPress theme that comes with bold vintage looks and distinctive color schemes. It makes use of the Serif font along with a large main image that has a tall caption. Retro comes with WarriorPanel which is easy to use. This a Vintage WordPress theme with an unique retro style design and lots of useful features. The theme is a Multi Purpose and responsive website template perfect for displaying creative portfolio, photo gallery, modern business blog etc. This is a nice retro theme with a beautiful tumblr-like design. Hartee is a theme for WordPress with good customization options and responsive layout. If you want a minimal and stylish design for you website Reboot is a good choice. It has a beautiful, minimal and fully responsive layout and it has been build on Twitter Bootstrap. It is perfect for creative websites like Designers, Photographers, Motion Artists etc. Secundo is a stylish retro theme for WordPress with responsive design. It has good features and customization options. It has been built with Bootstrap. This theme is a responsive WordPress theme. It is perfect for Creative portfolio style websites and personal/professional blogs. It is feature rich and easy to use because of the page templates. The Barbershop is a One Page Responsive WordPress Theme with a clean, unique retro/vintage design. The theme is packed with great Custom Post Types andTheme Options to display any kind of Work on your website. Powerful site template designed in a clean and minimalistic style. This template is very flexible, easy for customizing and well documented, approaches for personal and professional use. Style is what Sky is all about. A premium retro WordPress theme for portfolio websites that both you and your site visitors will truly enjoy. The Sky homepage is quite unique, using ajax to load your content flawlessly. Hipster offers the revolution slider, Instagram and Twitter feed, an extensive theme option panel, full screen background image plus blog with multiple formats. Hipster is perfect for bloggers who need all the premium plug-ins for the ultimate personal touch. This one page retro WordPress theme is fit for Instagram-addicted bloggers. The template built on HTML5 is fully responsive that makes use of impressive typography and lovely image effects. Vintage WordPress themes are usually simple and clean. Nostalgia embodies such principle with its minimalist layout. The background image is set in line with retro tones. Combining loose sketchy quality with fbold typography, Bold offers the traditional layout. It comes with timthumb that allows the user to resize images on thumbnails. The theme also makes use of five color schemes. If you find my work useful, please don’t forget to press your “HOME” button to go to the top of page. LIKE IT, SHARE IT.